According to a post on Geeksmack, Windows 7 SP1 Beta has been leaked and will be soon available for download on any of your favorite content hubs. The build which has been leaked carries a build string of 7601.16543.100403-1630 v.159, which means that it was compiled on 3rd April 2010. At this point, it is hard to tell on what is new to Windows 7 Service Pack 1 apart from the usual critical updates and security patches. 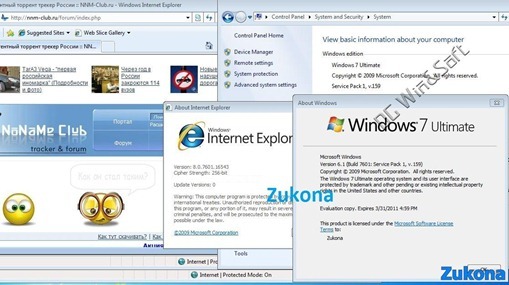 Windows 7 SP1 first made an appearance back in January of this year when screenshots from Build 7600.20500 were first surfaced on the Internet. This is not the first time that it has happened to some build of Windows 7. Many Windows 7 builds – including M1, Beta, post Beta, RC and RTM were all leaked before their scheduled release, or announcements. UPDATE 1: The build which the folks at Geeksmack has got hold of is 6.1.7601.16537.amd64fre.win7.100327-0053, which according to their sources will be leaked all over the Internet very soon. This build was compiled on 27th March and is slightly older than the build seen in the screenshot above. Thanks Paul for the clarification! I got sp1 now! Thanks!